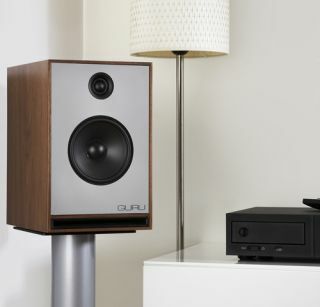 BRISTOL SHOW 2013: Guru Junior to make its world debut | What Hi-Fi? Among the numerous launches at the Bristol Show this coming weekend is the new Guru Junior standmount speaker from the Swedish speaker specialist. It sits below the company's QM10 monitor loudspeaker, and has a smaller cabinet and price tag (£795) than its bigger brother. Guru claims the Junior can deliver deep bass and maintain a 'neutral sound' from 34Hz up to 30kHz. Designed for placement close to the wall behind it, either on speaker stands or mounted on wall brackets, the Guru Junior will be available next month in piano black, white or walnut veneer finishes. Sensitivity is 87db/w/m, impedance is 6 ohms and the MDF/aluminium cabinet houses a 20.5mm soft-dome tweeter and 10.2cm coated paper mid/bass driver. To discover other highlights due at this weekends Bristol Sound & Vision Show, read our dedicated blog.